Body Shaping is not a simple process and to get effective results, you should consult a doctor that can provide you with not just one—but several methods to help you with your concerns. For this reason, Skin MD and Beyond offers not just one, but two advanced techniques for skin tightening treatments. 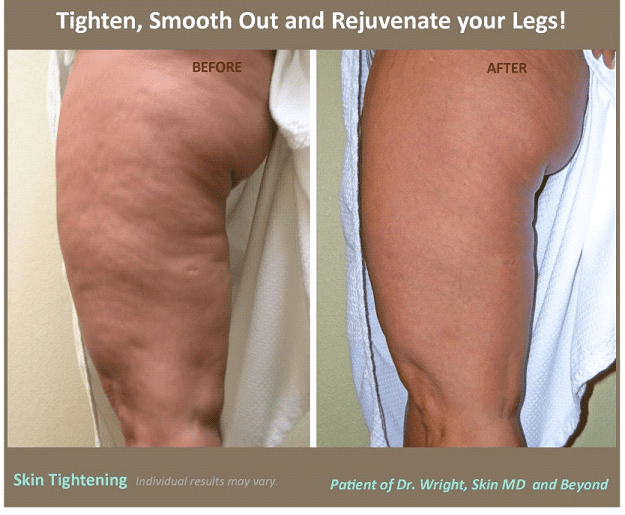 Having had the first of both Skin Tightening Machines in the USA, our expertise in this procedure has provided great outcomes for a large number of patients. While there are now many units in Texas, Skin MD and Beyond still remains a leader in skin tightening technology and as such Dr. Wright is on the National Advisory Board for both companies. Each offers a unique form of radio frequency energy to tighten loose or sagging skin in the stomach, thighs, legs and even arms. This is without an incision or recovery time! Both devices are non-invasive and stimulate new collagen and growth of the elasticity of the skin. For many people surgery can be a scary thought, as results are permanent and you cannot go back once under the knife. Surgery not only involves cutting, you have to consider the expense, down time, pain, and fear of the unknown. That option may not be suitable for your lifestyle. By working non-invasively, the VelaSHAPE III and ThermiSHAPE can work toward your ideal look. 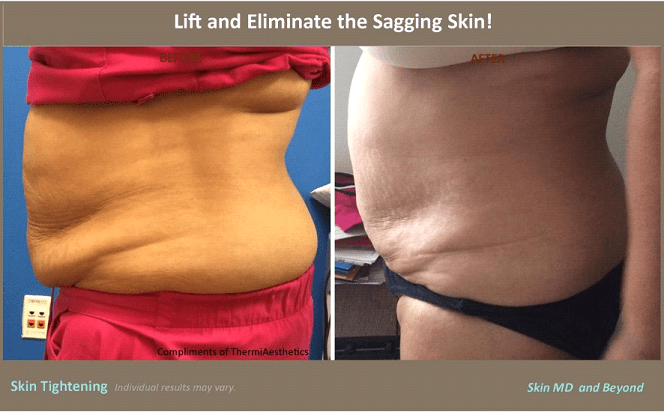 Skin MD and Beyond was the first clinic in the United States to begin skin tightening treatments with the ThermiSHAPE technology and was the pioneer to bring VelaSHAPE technology to the Dallas-FortWorth Metroplex. The VelaShape III Platform is set to be THE Body Shaping Power House. Several devices on the market advertise a series of treatments to reduce only local areas of fat and do not offer a “full body” solution. Whether it is to tighten skin, eliminate belly ripples, focus on one small area of fat, or do a full 360o abdominal shrinkage protocol, with VelaShape III , our patients see results in all these areas of concern. The treatment is so popular at our clinic; we had to buy a second machine to keep up with the demand! The Next Generation technology is ThermiSHAPE (known as ThermiSmooth 250 in Clinical Study Phase) which uses a Thermi-RF(radiofrequency) system to incorporate a specially designed thermistor regulated hand piece, to uniformly heat the dermis (inner layer of skin) while cooling and protecting the epidermis (outer layer of skin). This targeted radio frequency energy offers a non-invasive, completely safe, non-surgical procedure which tightens, firms, and contours your skin, through natural contraction and stimulation of collagen. This shrinking effect is what causes the skin to naturally tighten, smoothing skin and reducing the appearance of wrinkles, cellulite, skin laxity and/or fat. With both technologies, most patients describe it as a “warm massage”. The hand piece is gently massaged over the treatment area in a circular or up-and-down motion and lowly warms as it delivers energy deep into your skin. Your skin temperature will be monitored during your treatment to ensure it reaches and ideal temperature to get the most effective results. Treatments may last 30-60 minutes depending on the size of the area and a series of treatments is recommended.